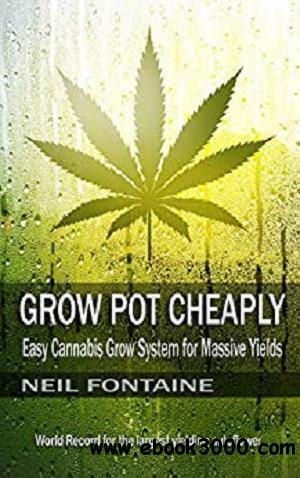 Download Torrent "Grow Pot Cheaply: Easy Cannabis Grow System for Massive Yields - 2019- MOB..."
We will learn a beginner's friendly grow system, growing in a hydroponic medium, coco coir. It is laid out step by step. I wanted everyone, green thumb or not, to be able to easily grow their own medicine. This system was developed for that reason. All we have to do is follow those steps and our first grow will be a success. We will learn how to set up our grow room, how to water our plants, how to feed, how to mix nutrients, how to grow huge nugs, how to grow huge autoflowers and photoperiods, learn how much to water with, learn how to fix issues with our plants, learn what nutrients to use, learn all the materials we need, learn how to germinate our seeds, learn how to clone, learn how to train our plants for big yields, learn how to cure, learn how to set up electricity, and more. In short, we will learn everything we need to be master growers. Everyone that followed this grow system and didn't add or take away from it had a successful first grow. You can too. Hi, I'm Neil Fontaine, the author of this book, who grew the largest autoflowering marijuana plant in the world. I don't share my world record to brag but to show that you are in good hands. The autoflowering Critical yielded 2.91 pounds dry. I am going to teach you the grow system I used to achieve that. I documented this whole grow on the Youtube channel GrowPotCheaply, under the playlist "Massive Auto grow step by step, how to grow journal." Over the years, I have taught many new growers how to grow with my system. They are growing great marijuana now. The best thing about this system is how simple it is. On my wife's first grow, following this system, she grew an autoflower in a 2-liter pot and got 10.8oz dry. That is not even easy for me to do. Her other plant, autoflower Colorado Cookies, yielded 5oz. That is very respectable. She only grew 3 plants and yielded 19oz, or 1 pound and 3oz on her first grow.